The Team Report is only available on our Business Plan. More information on our plans can be found here. Report exports What should I do with this data? 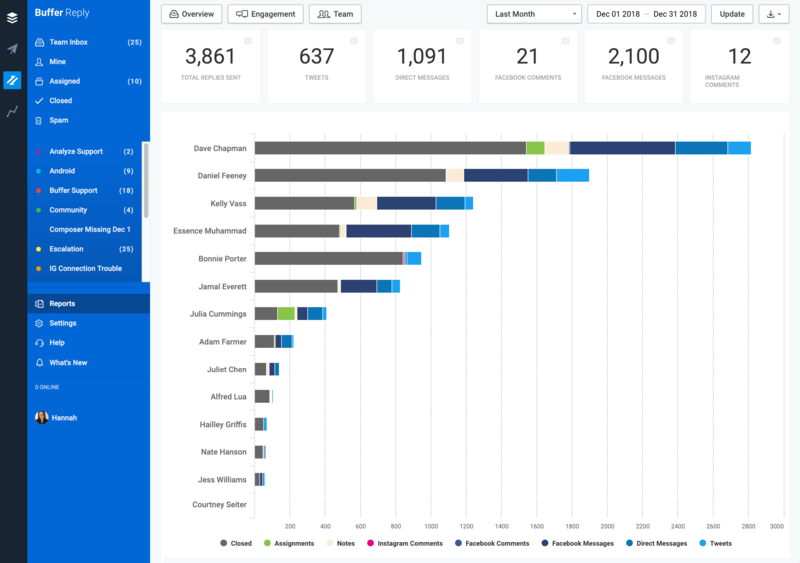 The Team Report is where you'll find insights on team member activity. This report helps to answer questions like who sent the most replies last week, how many internal notes are being added, and how many conversations a team lead assigned. It's also a great tool to see, week over week, if your team is sending more or less replies, and which types of replies are sent most. In the chart below, you'll see volume by team member. Hovering over a team member will display their individual numbers of replies sent, broken down by conversation type, along with the number of notes they've added, assignments they've made, and number of times they've closed conversations. Please note, the Closed number indicates the number of times a team member has closed conversations during that date range, as opposed to the number of conversations they've closed. Various CSV exports can be downloaded from this report, by clicking the download icon at the top right of the page (next to the date picker). All: This report includes the total number of replies sent each day, by each team member, broken down by message type, along with the number of notes they've added, assignments they've made, and total the number of times they've closed conversations. Notes: This report includes the number of internal notes added each day, by each team member. Assignments: This report includes the number of conversations that have been assigned each day, by each team member. Closed: This report includes the number of times conversations have been closed each day, by each team member. Tweets: This report includes the total number of Tweet replies that have been sent each day, by each team member. Direct Messages: This report includes the total number of Direct Message replies that have been sent each day, by each team member. 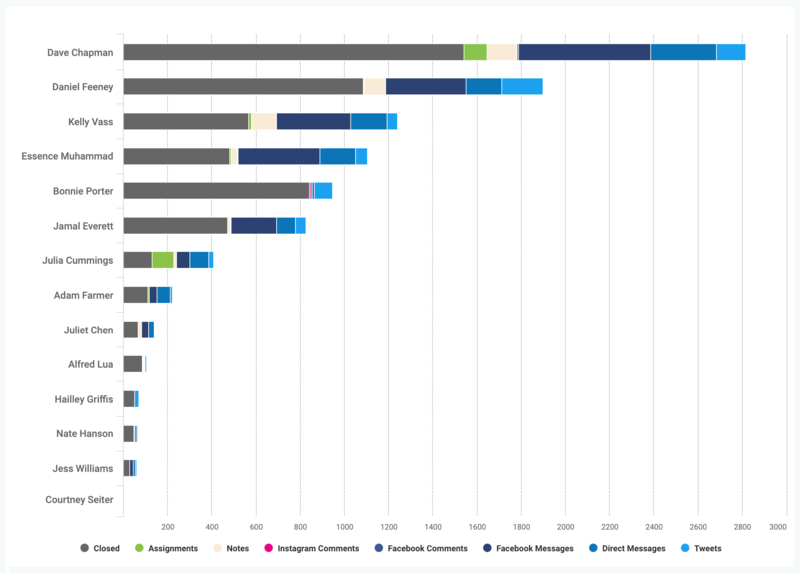 Facebook Messages: This report includes the total number of Facebook message replies that have been sent each day, by each team member. Facebook Comments: This report includes the total number of Facebook comment replies that have been sent each day, by each team member. Instagram: This report includes the total number of Instagram comment replies that have been sent each day, by each team member. The data in this report can be used to track team member productivity. It can also be a great indicator of whether you have the correct number of resources assigned to managing your support and engagement on social media, and also potential gaps in knowledge. For example, if a particular team member is sending fewer replies than usual, or assigning a larger number of conversations to other team members, this could indicate that they need some extra help. In the All CSV, you’ll see a row per team member, with the number of replies they’ve sent per message type, along with the number of notes they've added, assignments they've made, and total the number of times they've closed conversations. At Buffer, we use this report to find the total number of replies sent by each team member. We also use it to find the total number of replies sent per team.